In order to maximize the flexibility of use for different applications, all the expansion interfaces have software-configurable support for 3.3V and 5V boards, providing compatibility for more than 500+ different expansion boards available from various manufacturers. The core of the SensorIO board is the ST-Micro STM32F413ZH, a powerful ARM Cortex®-M4 MCU with a very rich set of peripherals presented into a 144-balls 10x10mm BGA chip. 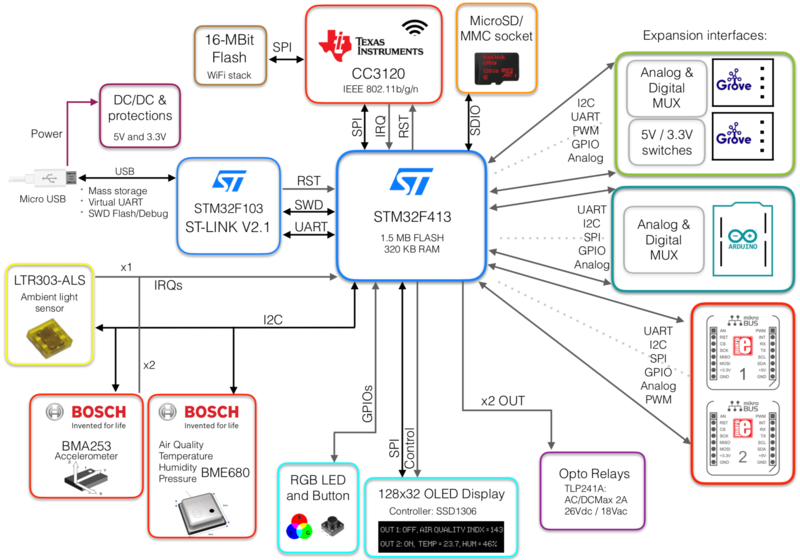 STM32F413ZH MCU, ARM Cortex™-M4, 1.5 Mbytes of Flash memory, 320 Kbytes of RAM, FPU unit w/ DSP instructions, 125 DMIPS @ 100 MHz. 47 x Total exposed GPIOs! (1) The board can be powered through the on-board USB Micro B connector or directly by the +5V pins of the MikroBUS connectors. Please check the Technical specifications and the circuit Schematics for more details. The board supports 5V input logic levels in all of the I/Os. The analog inputs of the Arduino and Grove interfaces also provide 5V-support through level conditioning stages. Check the expansion interfaces section for more information. The ST-Link interface also exposes a virtual serial port in addition to the SWD debugging interface, which can be used to print debug and logging information during the application development. SensorIO integrates the Industrial-grade CC3120R SoC from Texas Instruments, a Wi-Fi® Network Processor designed for Internet of Things applications. A dedicated ARM® Cortex®-M3 Microcontroller Unit (MCU) completely offloads Wi-Fi and Internet protocols from the application MCU. This subsystem includes an 802.11b/g/n radio, baseband, and MAC with a powerful crypto engine for fast, secure Internet connections with 256-bit encryption. The device also supports WPA2 personal and enterprise security. It uses an external SPI flash to store the Wi-Fi® and security stacks. The board takes advantage of the main MCU's 20+ communication interfaces available through its 114 I/O ports to provide an unmached set of options to extend its functionalities through the expansion interfaces (Grove, MikroBUS and ArduinoR3 sockets). Most of the Grove interfaces on other ​Grove-compatible​ boards include multiple connectors since they have one fixed bus hard-wired per connector. This means that, in order to support the 4 interfaces types, they need to provide several connectors. SensorIO supports all the interface types in each connector, thus achieving maximum flexibility. 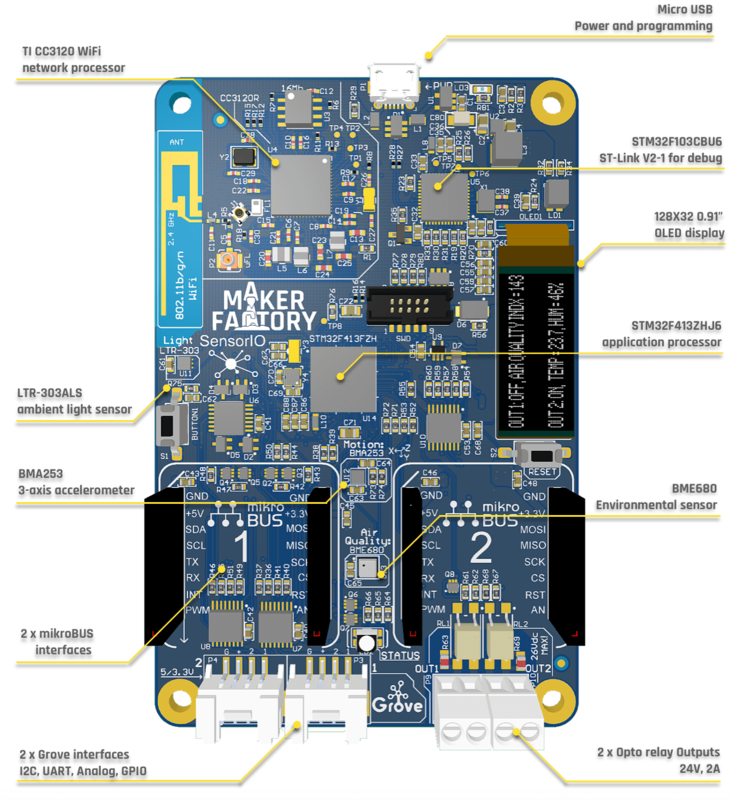 In order to quickly evaluate the board and prototype a serie of use-cases, the device integrates a set of sensors, two opto-isolated solid state relays for controlling power outputs, an RGB LED, a push-button and a small 128x32 pixels OLED monocrome display useful to show real-time information. Please refer to the Schematics section to learn how to control these peripherals. Most of the peripherals are showcased on the out-of-the-box application.